My Dad and I drove to Washington to pick up 'Ol Blue from my grandpa. 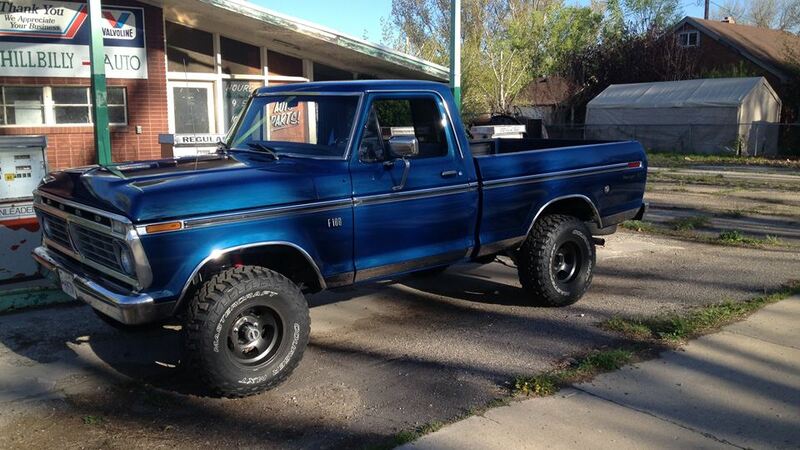 He ordered and bought it brand new in 1973, its a Ford F-100 Ranger XLT, came with now power steering! Don't know what the heck he was thinking! But anyways, we picked it up in 2010 Easter weekend, it was a long and scary drive back with the truck on the trailer. About a year later we started our long working process on her, tearing her down to the bottom and start working from the bottom up! From grinding all the rust off the frame, painting it with por-15, to popping dent out of the newly found bed, using body filler, learning how to weld floorboards in place, how to hide welding paths, how to do touch up paint, what a bushing was, how a transfer case works, and the hardest part, . . . . The wiring, working with the whole electrical system (which wasn't really that bad) was quite the hassle, not sure if we actually crimped a wire connection down good enough, and for the longest time couldn't figure out why the horn wasn't working! Six long years and we've got her finished! In enough time for me to take some girls out on dates, drive with my buddies, and spend a lot of time with one really special girl! My Dad took my Mom on some date nights as well. But from the knuckle scrapping, sailor mouth talking, tool throwing, blood drenched, tear soaked, sweat stained years, we got her all done! From the horrible cab corners, to the rusted out floor boards, and rusted to crap bed, and the amazing luck we had in finding a short bed (because everybody knows how hard it is to find a Short bed in good shape) in so much better condition! I learned how to use a blow torch to help get bolts off, how to put an American V-8 back together, piston rings and all! Keeping the original 360, which served the family really well, and went everywhere! My Dad knew a lot, but we had to refer back to some old shop manuals at some times! Haha and even had some really good friends come over and help us! From the "break-in" stages of the motor till present, its run like a beast! 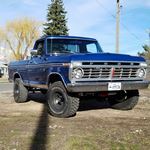 Sounds amazing from the Duel headers and exhaust to the aftermarket 4-Barrel carburetor and intake manifold, shes gets a whopping 6-8 miles per gallon! . We installed power steering and power front disk brakes, new lights, kept the original seat and seat belts, this has been a long 6 year journey for us! And we can't wait for our next project!. . . . . When Mom lets us! HAHA!! Maybe a Mustang, a '68-'69 Shelby if i had my way HAHA!! Who knows! But for now, Ol Blue is the best lookin, best sounding, and all around the best truck Around! Grandpa got to drive Ol Blue for the first time after not driving it for over 25 years! I was in my first car show with the ol Girl! Had a blast and cant wait for the more shows we go to!! Now with warmer weather comes lots of baths for the ol girl! Door panels are finally on! My dad and I finally got the door panels on the ol girl!